This unique reference classifies the clothes and accessories of the 12th through the 15th centuries along social lines. Garments of every type, from the wardrobes of peasants and nobility, appear in over 200 period illustrations and patterns. Helpful advice covers: choosing fabrics, placement of seams, draping and folding garments, and more. 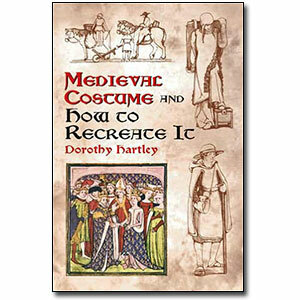 It is an unabridged republication of Dorothy Hartley's classic Medieval Costume and Life, which was originally published by Charles Scribner's Sons, New York, 1931. Dorothy Hartley traveled extensively around the British Isles, observing and writing down all that she saw. Through her writing she preserved rural customs and lifestyles. Author of Food in England, which was first published in 1954 and remains in print to this day, she also published a six-volume work on Life and Work of the People of England. She died in 1985 at the age of 93.